San Francisco (California, U.S.A.) based metal quartet Machine Head delivered a punishing return to form with 2004's Through The Ashes Of Empires. It was an album that many proclaimed as their best effort since 1996's The More Things Change and some even went as far as saying it was their best since their seminal debut, 1994's Burn My Eyes. The combination of the elements of those classic early releases combined with their more modern melodic delivery certainly brought the band (who is vocalist/guitarist Robert Flynn, guitarist Phil Demmel, bassist Adam Duce and drummer Dave McClain) back from the brink of metal extinction in a big way. It should be of no surprise then that the spotlight is once again back on the band with the anticipation building for their sixth studio effort simply titled The Blackening. Don't let the beautifully clean guitars that appear at the beginning of Clenching The Fists Of Dissent mislead you. It builds slowly for a little over 100 seconds before the down right furious and punishing distorted guitar tones of Flynn and Demmel appear signalling the band's intentions in no uncertain ways. Thrash influenced riffs, the band's trademark use of natural guitar harmonics and Flynn's unmistakeable vocal bark are all here in this ten and a half minute opener. It's a long haul by Machine Head standards but they pull it off in fine style in the first of four tracks that top nine minutes. It's an interesting move for the Bay Area act but one that they have shown early on that they can handle with ease. The lead work from both Flynn and Demmel is blistering above the rumbling and ever reliable rhythm section of Duce and McClain. The stomping, slower groove and excellent dynamics of Beautiful Mourning are further enhanced by Flynn's excellent use of melodic vocals and for a pure example of pissed off metal, there's no going past the scorching pace of Aesthetics Of Hate. 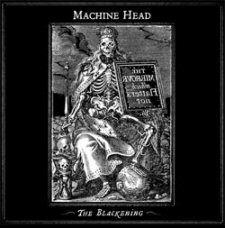 This is classic Machine Head, perhaps even more so than 2004's excellent Through The Ashes Of Empires. The likes of the crushing Now I Lay Thee Down, the busy yet flowing and ever morphing Slanderous and the outstanding nine minutes and four seconds that is Halo all have a power and feel to them that would allow any or all of them to sit comfortably on The More Things Change. Wolves is yet another example of the excellent fret work from Flynn and Demmel as they unleash the dual axe attack via harmony lead after harmony lead, a trend which is prominent on The Blackening more so than ever before. Over the course of their releases, Flynn and Co. have be responsible for some amazing closing songs - Block (from Burn My Eyes), Blood Of The Zodiac (from The More Things Change), Descend The Shades Of Night (from Through The Ashes Of Empires) - and now, you can add A Farewell To Arms to that list. Epic barely describes it as it ebbs and rises to a finale that will leave your jaw firmly on the concrete. Where other bands have dropped the ball when it comes to capturing the essence of long metal songs in recent times, Machine Head have mastered it. The Blackening is Machine Head through and through. The trademarks are there and it doesn't take a genius to figure out that their now stable line-up is on firing on all eight cylinders when they are putting together material of this calibre. Time will tell as to whether this album is their Master Of Puppets, but for now, rest assured in the fact that Flynn and Co. have delivered the goods in a big way. This one will tear you a new one - guaranteed!